I admire folks who know they’ve got a good idea and are willing to keep at it until the rest of the world notices. 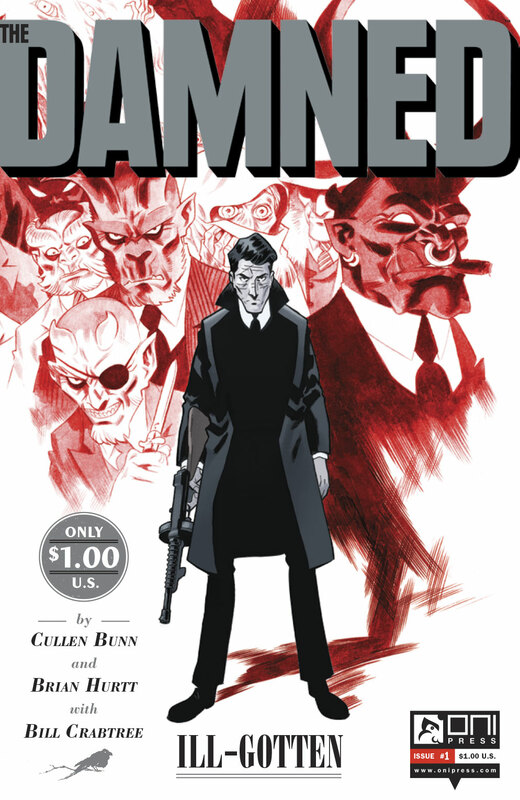 The Damned by Cullen Bunn and Brian Hurtt originally launched in 2006. There were 8 issues in two miniseries through 2008. Since then, Bunn and Hurtt have had a lengthy run on The Sixth Gun. That’s recently ended, so it’s time to see if The Damned can find its audience now. Oni Press is making the series available for sampling in two ways: there’s a new collection of the first five issues from that previous run, Three Days Dead, at the introductory price of $9.99 and newly colored by Bill Crabtree. (You can see examples of before and after at this interview.) And the new #1 issue is only a dollar, out next Wednesday. There’s a preview at the bottom of this post. The Damned is the story of Eddie, a cursed man in a world of gangsters where demons are the mob bosses. If he’s killed, the next person to touch him dies instead, and he comes back to life. In this new issue, which doesn’t require having read any previous, he’s running a nightclub. Then an old friend shows up looking for sanctuary for a few days, without revealing who’s after him. I don’t normally care for gangster stories, horror works, or supernatural crime tales, but this one is well done and gripping. They call it “monster noir”, which makes for a good combination. The premise allows for plenty of moody narration in keeping with those old-style gangster flicks, and Hurtt’s art is nicely atmospheric.